Recently, Jürgen was privileged to make a guest appearance on Missinglettr’s Master of Letters Podcast, a podcast where CEO’s, marketers and consultants share their tactics and activities that are driving traffic to their sites. Here is the full text of the Jürgen Strauss’ interview on the Master of Letters Podcast Episode #32, with Ben Dell. Ben: Welcome to the Master of Letters Podcast where CEO ’s, marketers and consultants share the tactics and activities that are driving traffic to their sites and helping them engage with their audience. If you want to learn what’s working for others right now so that you can grow your own business, then you’ve come to the right place. I’m your host Benjamin Dell, and here’s today’s episode. Ben: Hello! We have today Jürgen Strauss. Jürgen is the Chief Innovator and Founder of Innovabiz, with a vision to help exceptional business coaches make a difference. 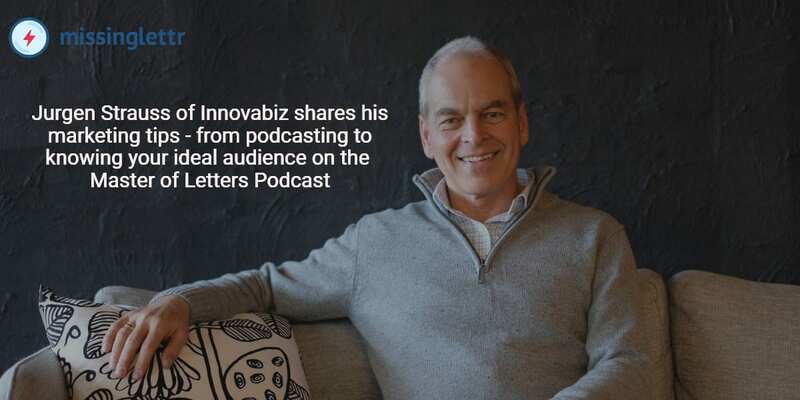 Jürgen is also the host of the InnovaBuzz podcast, with over 120 episodes published so far. Prior to founding Innovabiz, Jürgen worked in the science and chemical industries leading large teams across Asia, Europe, India, North America and Australia. Jürgen, thanks for joining us. Jürgen: Thanks, Benjamin. It’s a pleasure to be here. Benjamin: It’s very early on the day. I was trying to work it out to be not that early but it’s one of my first things. I’m trying to work out my brain here whether that’s all continents covered, in terms of the teams that you’ve led – Asia, Europe, India, North America and Australia, most of them I think. Jürgen: Most of them, yes. Ben: Cool. So tell us a bit about how you got to where you are today. Crucially, what is it that you do to make money and how does your business operate? Jürgen: Ok. My background is in Science. As most young professionals when they get into the area that they thrive in, I was very quickly promoted to manage people and so on, and then I had a 27-year corporate career where I ended up in marketing and business management. When I got fed up with the corporate world, I decided I could take those marketing and business management skills into a small business. So that’s essentially how I ended up here at Innovabiz. I’ve got a global team that I manage now because that pretty much was something that I did all throughout my career, was work with global teams, so that’s something that is very comfortable for me and I know how to manage that really well. What we do at Innovabiz is partner with innovative and exceptional business coaches and consltants to get them more leads, to enable them to get more leads and grow their business. So our objective is that they grow their business but also that they get to make a difference to more of their ideal clients. We do that through building them a platform, then also making sure that the message that they deliver to their ideal client is a really good fit for what they do, how they make a difference and to the right ideal client. Ben: So, a coach is your customer, right? Ben: You’re empowering the coach themselves. You’re coaching the coach. Ben: I just have an interest. Why are you training them? Why are you not being direct to the marketing, coaching others in that sort of space? Is there a particular structure there or is it a market decision? Jürgen: Well, it kind of evolved because we’ve got a variety of clients but a lot of them are coaching their clients in some manner or another even if they’re not business coaches or consultants as their primary profession, they’re still doing a lot of coaching. There are training elements to their business. There’s a lot of publishing and content involved in that, which is one of the areas that I think we’re really good at. And then, in terms of business coaches that we partner with, that’s a really great way to foster, leverage and make a difference to a lot of people. If we help them get in front of their ideal audience and they transform those people and help them out, that’s something that we can kind of attribute back indirectly to our contribution. Ben: And coaching is such a trendy thing. You know, there are lots of coaches popping up all the time and there’s many already out there in the market, so serving that industry is a savvy move. In my mind, not being in that world, I would wonder how difficult it might be to convince coaches that they need to be coached in the first place, so do you find this, psychologically the sort of egos that they have and do coaches want to be coached? Jürgen: That’s a good point. I guess, our ideal client, the ones that we really like to work with are the ones that let us do our thing in terms of what we are good at – the digital marketing part, setting up their systems, making their systems run really smoothly, working on the message. That’s probably where we work together for the long haul because I know the coaches are good at languaging and so on, so we help them craft their message. Most of our clients who are in the coaching space, they a little bit intimidated by the digital stuff and while they want to know a little bit about how it works, they don’t actually want to go hands-on in that because they recognise that it’s not the best use of their time. The best use of their time is actually getting out with their clients and working with their clients. If they can hand off things that they don’t like doing or they’re not good at, that gives them a hell of a lot more leverage and power to work with their clients and do the things that they are good at. Ben: Yeah, and getting comfortable with digital as what you were saying and embracing all of those technologies and opportunities is key and sounds to be a possibility as you talked about. There’s a nice segway into talking also in technical marketing. Your talk at the upcoming conference, Uppercase, next week, although when this goes live, it will about 8 weeks in the past. The listeners can check out the conference talks. Check it out if you’re listening to this. Your talk, the title of which is “Podcasting for Profit”. Tell me a little bit about that. I know you’re just preparing. Just before we went live, you were saying that you’re in the process of preparing, so I’m not expecting you to verify the whole thing but I’m guessing you maybe sort of recommend podcasting to some of your coaches as a channel they might want to use. You published a hundred or so episodes so it’s clearly something that’s working for you. Talk to me a bit about how you’re embracing what you do with podcasting and some of the lessons you learned along the way. Jürgen: One of the big things for me is podcasting – it is an amazing platform. We’re here talking online and we can just get on camera and talk online using the tools of the internet that are available to anyone these days. Now, with a podcast, you also have similar tools that are available to anyone and basically, anyone can start up what could be described as a radio station so you can be a talk show host. Then there’s a lot of strategic things around building a podcast to give you profit and that’s around, first of all what is the topic that you’re good at, that you’re passionate about and that is going to add value to an audience and the second thing and integral to that is who is the audience, so you need to be really clear about who is the audience and what value you are going to deliver to them, which is kind of one of the fundamental principles of marketing. Then, after that, it’s about how are you going to deliver that message. So we do a lot of interviews but then, of course, you can have a discussion like we’re having now, which is a little bit of an interview format but can be just an on the couch Q&A session between 2 people or you can have a live Q&A session using one of the live streaming media, or you can just do solo episodes, which I do from time to time. I find those a little bit challenging because I still struggle a little bit to visualise an audience in front of me. Whereas if I’ve got someone I’m talking to, that’s much easier. It’s just a natural conversation. Ben: And then your strength for sure plays a big part of it. Jürgen: Yeah. And then of course who do you have on as a guest. That’s one of the things that we’ve learnt along the way. I started off because I had this 27-year global career and then moved into a local business. In my international career, I had so many connections that I wasn’t really sure how I could engage them to help with my little local business. And when I started the podcast I thought that’s how – they can help me because a lot of these folks were now CEO’s of fairly significant corporations and they’re doing some really unique things. So I had them all along to talk to me about how we’re doing in the podcast and then I started getting connected to people that they knew that I didn’t know at that stage. And so, all of a sudden my network expanded and I was talking to some amazing people. I ended up, I think in episode 54 having a one hour conversation with Michael E. Gerber. That’s pretty priceless. So I’d say you get to have these master classes with these fabulous people that you couldn’t possibly pay for. I mean if you wanted a one hour master class with Michael E. Gerber, you’d probably be paying tens of thousands of dollars, and then I get to share that with my audience as well. So that’s really great. The next step then is how do you translate that into business. So the obvious one of course is it gives you a lot of credibility. It gives you content that you can publish regularly and share with your audience, and some of that audience ends up becoming leads and becoming clients. The other way to use the podcast is also to actually get people on, that you’d like to become clients. You invite them to come on because that’s a good way to start a relationship and then that relationship can build, and if you’re a good fit for one another and there’s a need there, and we can fulfill that need, then that can deliver some business as well. All of those examples that I’ve learnt over the 3 years now, it is that we’ve been doing the podcast. I’m working with my clients and I’m encouraging , all of them to start a podcast. Ben: It’s such an empowering medium and for me, these are great nuggets to take away and just amplify, and how easy it is essentially, for anyone to do it even if you think you don’t have the audience. As you were saying, you know, you got clients that you have in your past life, followers on Twitter, existing customers, whoever they might be. There’s going to be a handful of people that would be more than happy to jump into the cause at the end of the day, it’s a promotion for them as well to have that conversation and kickstart that podcasting journey. But I love also just the basic idea you were saying that if you know who your customer is, whether it be consulting or something a bit more service, and you have individual customers you can target, inviting them onto a podcast is such an easy, easy sell. I mean some sort of similarity to parallel, this conference we’re putting on Uppercase, two weeks, 102 speakers, I think, and you’re one of them. I’m very much looking forward to that. As I mentioned your talk is “Podcasting for Profit”, so check it out if you’re listening to this. It’s the same value. It was really easy actually in hindsight to recruit the speakers because it is such an obvious opportunity for both parties, as a platform for us speakers to share what we have to say and podcasting share the same principles which are really good. So talk to me now just in terms of the marketing and the tactics and nothing else, what is the channel that is working most effectively for you? Is it podcasting or other channels that delivering more? Jürgen: Probably podcasting. I’d say podcasting will definitely be one. We’ve just reinvented our website. We’ve rebuilt the whole lead funnel and lead generation strategy on this. We’re revamping that and we’ve taken a multipronged approach and funneling people into different channels depending on what their interest might be. We’re still working on that. One of the trends at the moment in all of online marketing is getting very personal around delivering information, whether it’s lead magnets and so on. What we’ve actually got is a questionnaire when people go to the lead magnets. There are 3 questions and then they get channeled off into different areas depending on how they answered those questions and we’re looking to refine that a little bit more because that’s still a bit rough around the edges at the moment. Implementation is a big thing. And what’s the saying “Done is better than perfect”. Ben: Absolutely. If you don’t start, you will never get finished. Let alone started. So you’re saying podcasting is the most effective channel for you today. What are you doing to maximise or increase the chance of your success when it comes to podcasting? Do you have very specific call to actions? Is it all delivered to your show notes that you have some links in there and anything else? How do you improve the chances that people listening will in some way continue to engage with you in some sort of action? Jürgen: Yeah, that’s a really good question. What we have, we do show notes which is essentially a summary rather than a transcript. We’re thinking about offering the transcript as a download. We’re not really sure how much value that would add to the audience but we’re thinking about that. We do a summary with show notes and links out to the guest when we have them on and we then have some calls to action around that. We promote it through our newsletter. We promote it really heavily through all the different social media channels. Our guests are usually really good at promoting it, so often we can tell through the analytics how well the guest is promoting it if there’s a big spike in one of the episodes – it’s either that the guest got a lot of following on social media or they’ve been really active in promoting as well. So that gets us a lot of new engagement and then on the social media we go on and engage with the new followers that we get and just keep building on those relationships. 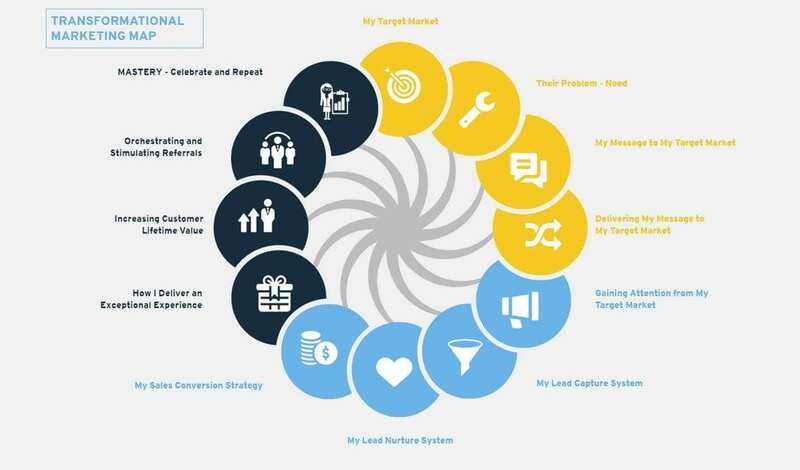 And a lot of people sign up for one of our lead magnets through that and the big one we’ve got at the moment is the Transformational Marketing Map, which outlines our entire marketing process in an overview, with diagrams and with a mini training course for those interested to work through. The whole thing is really just a marketing course. Ben: Give me the link after this. I might actually include it in the show notes for people to get value out of those or just as an example of something that they might want to try. These call to actions are you referencing them, just on a very basic and a textual level? Are you referencing those throughout the podcast? Do you have like a segment that amplifies that in a message? How is that delivered? Jürgen: It’s basically just in the show notes itself. We haven’t been advertising at all in the podcast and that’s been a conscious decision. I’m probably going to change that a little bit in terms of promoting some of our own things there. I want to keep the thing really ad-free, but at the same time promoting the things we have, that I think can add value to the audience. It’s a bit of balance there, which I’ll cover in more detail in the presentation that I’m putting together for the Podcasting for Profit. I’m saying everybody thinks about advertising and sponsorship being in the podcast that that’s how you get revenue from your podcast. The thing is unless you have tens of thousands of followers or subscribers you’re unlikely to find somebody to spend a lot of money or support in advertising or sponsoring the podcast. It’s probably good to not spend a lot of effort on this. There are other things that you can do that will get you a lot more return on investment and time. Ben: Yeah. And as of anything, the way that I like to approach things is as long as you’re starting from a point where you’re delivering value, and you’re confident that there’s something that people will get from it through the content and through the conversation and everything else, everything else will follow and the power in people leading a conversation or imparting lessons with, being as if they gained something from it or value, that’s gonna carry you through quite powerfully. It’s not how tangible it is. It’s not how trendy it is because you really can’t track those things but what’s the point? If you’re not delivering the value, don’t be in it just for the adverts. Start with the value and other things will follow. I talk about delivering exceptional value in any content we do. There is a lot of noise on the internet these days. There’s noise in social media. There’s noise in blogs and it’s really hard to keep up with everything but the things that stand out are the ones that you find valuable. If you deliver value to your audience, you will stand out. Ben: No doubt about it. That’s your differentiator. That’s your opportunity to show that you genuinely know your space, that you have a voice worth listening to. Ok. Let’s just aim to wrap it up with a couple of quick questions. Give us a tool that you can recommend to others that’s not Missinglettr. Give us a tool that’s helping you to grow or market your business. Jürgen: Well, I’m a really shiny widget person so I need to focus. But the one, well, there’s a couple actually that I really couldn’t live without at the moment. One of those is Loom for quick video recordings of anything on your desktop or you can do a camera recording so that’s invaluable for me to send quick messages to my teams and quick messages to customers. I also use it if we’ve got an issue with some software or something like when I do the help request, I actually do a video recording of what’s going on and that’s amazing because the support persons often come back and say that was really helpful and here’s what’s going on, as opposed to just some writing on a ticket. Often if it’s a small company and it’s the founder or owner that’s involved they actually connect with you because you provided that feedback. So that’s definitely one. A couple of others I’ll mention, Paperform is a really neat form software that we’ve been using more and more and the folks at Paperform are doing some wonderful things over there. The other one which I really love is Bonjoro which is another video app, sending quick video messages from your phone.Ben: Will definitely check them out and put links in the show notes. Perfect. Give some homework. Let’s make our audience work a little bit in between these episodes. Give them something they might want to try or do over that few days to help nudge their business boost a little bit. Jürgen: Well, I had to think about this one and the biggest thing, and this message comes across in all marketing, in fact I was writing some stuff about it for the podcasting presentation and that’s get really clear about your ideal customer, your ideal audience if you’re writing a blog post, your ideal audience if you’re doing a podcast. So get really clear about them and when I say get really clear about them, go through an exercise that actually identifies what are their needs, their wants, their frustrations, what are their beliefs, their behaviours, their typical behaviours, what’s their communication style, what are their preference around communication, really get to know them. Give them a physical form. I like to have a photograph of somebody that is a visual picture in my mind and I give them a name. So for example, I’ve got Podcast Pat, who is my avatar for my podcast audience and there’s WWPW – anything we want to decide on a podcast is “What Would Pat Want?”. I think in terms of marketing, in terms of writing blog posts, in terms of social media, I think that’s an invaluable exercise so I would encourage everybody to do that. Ben: I’d agree to that. We all too frequently write for ourselves and forget who the actual target audience is and the value that we’re trying to deliver to them. We can all do a little more of that, myself included. Interested in starting a podcast? Make clever and strategic podcasting a fundamental pillar of your marketing and open a whole range of opportunities to help your target audience.